I must admit I had some misgivings during the credits of Black Rock when I saw that it was written by Mark Duplass (Jeff Who Lives at Home, The Mindy Project, Safety Not Guaranteed) and directed by his wife Katie Aselton (The League). I happen to love all of the above, but I was worried that a movie billed as an escape and survive thriller about three childhood friends camping on a secluded Maine island would evolve into some kind of lightly comic, ironic commentary on the genre. As it turns out, I was in good hands all along. Sure, a camping trip! Nothing bad ever happens on camping trips! 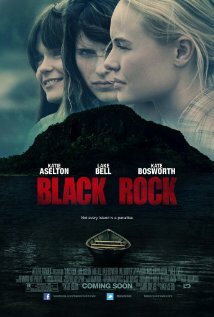 Sarah (Kate Bosworth) is attempting to reconnect with her lifelong chums Abby (Aselton) and Lou (Lake Bell) by arranging a weekend of drinking and roughing it on Black Rock, a remote island that served as their idyllic childhood playground—which is an important plot point. Lo and behold, the gals bump into a trio of poachers, one of whom (Will Bouvier) is a distant acquaintance from their youth. Not wishing to appear standoffish, Abby invites the hunters to share their campfire since they have “a shitload of booze.” A series of unfortunate events take place, and soon the ladies are fleeing for their lives. Make no mistake, there are jarring scenes of naked brutality in Black Rock. But Aselton and Duplass avoid the well-trodden path to mere exploitation taken by so many in the “trespassing strangers” genre. The hunters here are not a bunch of degenerate hillbillies who want to take the women home and make ’em squeal like pigs. The events leading up to one group in pursuit of the other are a combination of misunderstandings and bad luck, as was the case in Eden Lake, another contemporary thriller that got a rave review here. Black Rock is fascinating, fraught with tension, and not lacking in white-knuckle moments. It also manages to be, um, uplifting thanks to the desperate heroism displayed by some very flawed characters whose survival depends on burying longstanding enmity and banding together in the face of a common enemy. 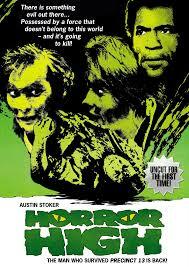 Oddly enough, this is NOT a prequel to Return to Horror High (1987) reviewed here a little less than a year ago. Instead, it’s a high school variation of Dr. Jekyll and Mr. Hyde about a chemistry nerd that invents a potion releasing his inner maniac (who for some reason walks pigeon-toed). 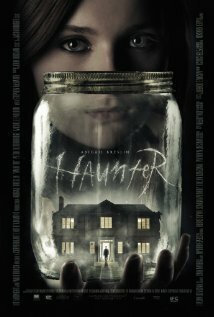 While I cannot recommend Horror High (a.k.a. Twisted Brain—what’s wrong with that title?) owing to its excruciatingly laborious pace, sports fans may want to check it out to see some pro football stars (“Mean” Joe Greene, Craig Morton, D.D. Lewis, Billy Truax) from a bygone era filling out the cast as assorted cops and jocks. Vernon Potts (Pat Cardi) is a perpetually bullied four-eyed Poindexter who transforms into a somewhat hairier and nastier version of himself when he’s forced to drink his own formula by a crazy janitor bent on revenge after Vernon’s guinea pig, Mr. Mumps, kills the custodian’s cat. It sounds complicated, but it’s mostly tedious beyond belief. Seriously, there is a scene in which Vernon phones his father, a wheeler-dealer businessman of some kind who is never at home, that leads to an interminable sequence of his dad arguing with his new wife/girlfriend that ends (finally!) with the two of them going for a drive! My question for director Larry Stouffer and writer J.D. Feigelson: WHY WASN’T THIS SCENE CUT DOWN OR EVEN REMOVED COMPLETELY? IT HAS NOTHING WHATSOEVER TO DO WITH ANYTHING GOING ON IN THE REST OF THE MOVIE AND IS NEVER REFERRED TO AGAIN! Even as padding goes it’s staggeringly and mind-numbingly egregious. Our boy Vernon eventually gets around to slaying his tormentors—and pitching woo to cute girl Robin (Rosie Holotik)—before Lieutenant Bozeman (Austin Stoker) deduces that the spindly kid is a part-time killer caveman. But oh, the tedium, the endless tedium! 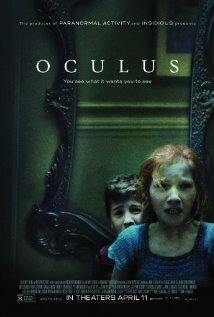 Horror High pushed me to my absolute limits; I’ve never been more tempted to fast-forward through a movie in my life. I really deserve a plaque. Or at least a comfy pillow.